Why do things taste and smell the way they do? Flavor is an expression of olfactory and gustatory sensations experienced through a multitude of chemical processes triggered by molecules. Beyond their key role in defining taste and smell, flavor molecules also regulate metabolic processes with consequences to health. Such molecules present in natural sources have been an integral part of human history with limited success in attempts to create synthetic alternatives. Given their utility in various spheres of life such as food and fragrances, it is valuable to have a repository of flavor molecules, their natural sources, physicochemical properties, and sensory responses. FlavorDB (http://cosylab.iiitd.edu.in/flavordb) comprises of 25,595 flavor molecules representing an array of tastes and odors. 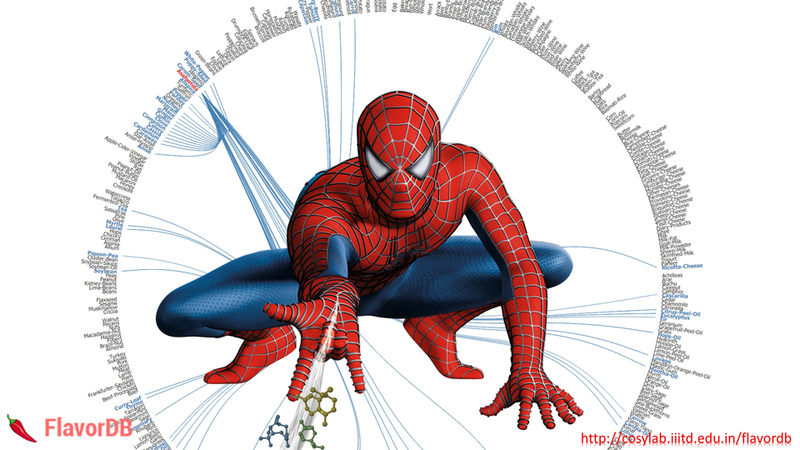 Among these 2254 molecules are associated with 936 natural ingredients belonging to 34 categories. The dynamic, user-friendly interface of the resource facilitates exploration of flavor molecules for divergent applications: finding molecules matching a desired flavor or structure; exploring molecules of an ingredient; discovering novel food pairings; finding the molecular essence of food ingredients; associating chemical features with a flavor and more. Data-driven studies based on FlavorDB can pave the way for an improved understanding of flavor mechanisms. Publication: Neelansh Garg†, Apuroop Sethupathy†, Rudraksh Tuwani†, Rakhi NK†, Shubham Dokania†, Arvind Iyer†, Ayushi Gupta†, Shubhra Agrawal†, Navjot Singh†, Shubham Shukla†, Kriti Kathuria†, Rahul Badhwar, Rakesh Kanji, Anupam Jain, Avneet Kaur, Rashmi Nagpal, and Ganesh Bagler*, 'FlavorDB: A database of flavor molecules', Nucleic Acids Research, gkx957, (2017).